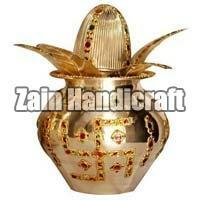 Buy the finest Brass Pooja Kalash at modest prices from us! 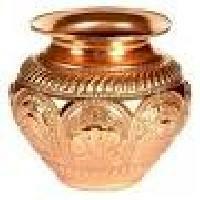 We are one of the acknowledged Suppliers of Brass Pooja Kalash from Moradabad, Uttar Pradesh. We take care to inspect the Kalash from all angles and considering all features before doling it out. 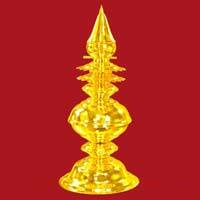 Moreover, we have sorted the entire logistics operations, which add much fluidity to the way we deal. Buy it at competitive prices from us! 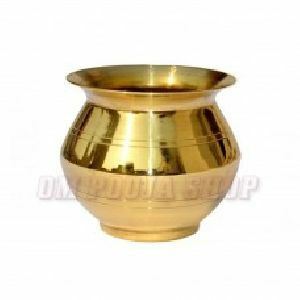 We are enlisted among the reputed Manufacturers and Suppliers of Brass Kalash . 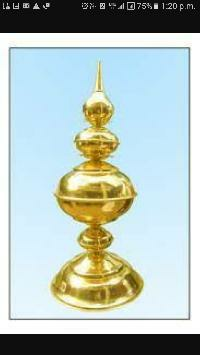 Made using excellent quality brass, our Kalash is widely used in religious ceremonies. 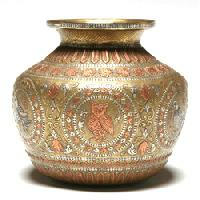 It features intricate designs and fine finish. 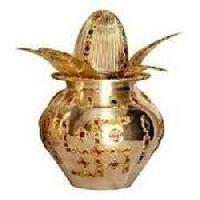 Buyers are free to place bulk orders of the kalash with us and we ensure its timely execution within the stipulated timeframe. Buyers can obtain it at affordable rates. We are known for providing only flawless range of products as we store the entire lot under safe environment in our spacious warehouse. Moreover, the lot is regularly checked by our experts. By making use of streamlined packing system, we become capable of meeting the bulk and customized packing requirements of the clients. Moreover, we ensure complete safety of the orders. Gold plated brasss kalash cn b customized to my size. 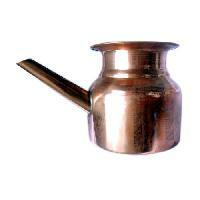 Loti / Small Kalasha is a pot filled with water. Mango leaves are placed in the mouth of the pot and a coconut is placed over it. A red or white thread is tied around its neck. 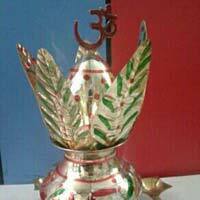 When the pot is filled with water or rice, it is known as purnakumbha representing the inert body which when filled with the divine life force gains the power to do all the wonderful things that makes life what it is. 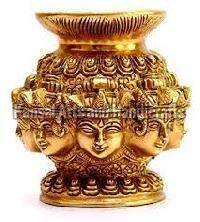 We are offering brass kalash handicraft ( handicraft video available if require).